Advanced Wound Care Market to Hit $13.5 Billion by 2025: Global Market Insights, Inc.
Sellbyville, Delaware, February 8, 2019	(Newswire.com) - U.S. advanced wound care market accounted for USD 3.7 billion in 2018 and is estimated to show lucrative growth over the forecast period due to rising number of surgical procedures and high awareness about wound care. Increasing incidences of chronic diseases such as diabetes and consequent foot ulcers will drive the regional demand. Unhealthy eating habits, sedentary lifestyle further expected to boost prevalence of chronic diseases rendering positive impact on industry growth in coming years. Global Advanced Wound Care Market will surpass USD 13.5 billion by 2025; according to a new research report by Global Market Insights, Inc. Technological advancements in advanced wound care industry leading to the development of better and innovative wound care products with enhanced effectiveness, rapid healing time, and no side effects will drive the industry growth over forecast period. Increasing awareness pertaining to the availability and advantages of these technologically superior products especially in developing regions will further support advanced wound care market growth over the forecast timeframe. Increasing number of surgical procedures will serve to be another positive impact rendering factor on advanced wound care market growth. Aging population coupled with increase in incidences of chronic disorders are attributable to rapid growth in number of surgical procedures. 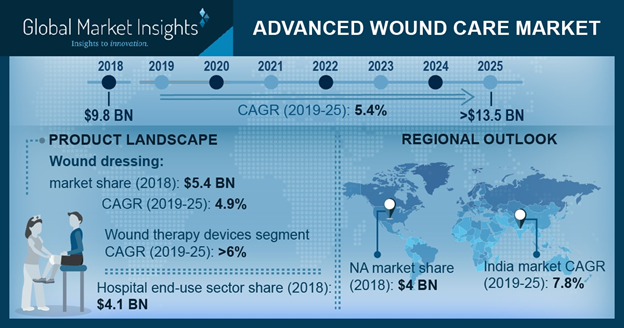 This will positively impact demand for wound care to treat consequent surgical infections and wounds, thereby driving industry growth during the forecast period. Hospitals segment accounted for 41.5% revenue share in 2018 and estimated to witness healthy growth in near future. Increase in number of surgical procedures conducted at hospitals and various reimbursement policies in developed economies for treatment purposes will drive the segment growth. Growing healthcare expenditure in developing economies and cost-effective therapies offered at various public and private hospitals will favor segmental growth.